Isotopic fractionation occurs at phase changes of water in the atmosphere. Two types of isotopic fractionations are involved. First, because the saturation vapour pressures of HDO and H218O water molecules are slightly lower than that of H216O, the condensed phase is enriched in heavy isotopes with respect to the vapour phase. During evaporation of sea water, the SD and S18O values of the vapour will be more negative than those of the liquid phase. This is an equilibrium fractionation. Independently, a kinetic effect results from differences in molecular diffusivities in air of these molecules. The molecular diffusivity in air of HDO or H218O is lower than that of H216O. This kinetic effect, which is independent of temperature, applies to non-equilibrium processes of evaporation and condensation. Both isotopic effects—equilibrium and kinetic fractionation—are eight times higher for HDO than for H218O. The initial isotope concentration in an air parcel can be expressed, with certain simplifying assumptions, as a function of sea-surface temperature, relative humidity and wind speed (Merlivat & Jouzel, 1979). Models have been constructed by Jouzel & Merlivat (1984) taking into account the kinetic frac-tionation associated with snow formation by inverse sublimation in a supersaturated environment and later by Ciais & Jouzel (1994) allowing the coexistence of supercooled liquid droplets and ice crystals in mixed clouds between —11°C and -30°C with different saturation conditions over water and ice. These models are able to reproduce the basic behaviour of SD and S18O in precipitation at mid- and high latitudes. Such works have outlined the fact that deuterium excess d in polar precipitation is largely determined by the source conditions and this has motivated attempts to use d as a proxy of ocean surface conditions. Petit et al. (1991) have pointed out that the sea-surface temperature largely determines deuterium excess values in Antarctic snow. Warmer sea surface at the source of the vapour produces a higher d in snow. Based on GCM results, the role of expected changes in relative humidity is less influential in determining the d value. It is therefore possible to infer from the deuterium excess in ice the temperature of the moisture source and, to some extent, the region of origin of the vapour producing the snow. 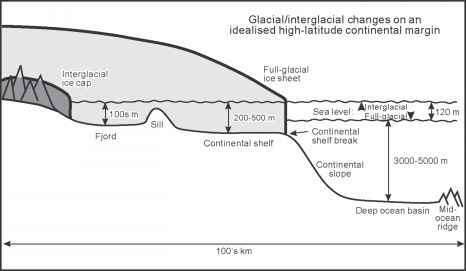 Such an approach is used to reconstruct palaeoenvironmental situations from the study of deuterium excess in ice cores, as developed in the next paragraph.